Juliana Ravel will do anything to save her innocent brother from the executioner, but what the supposedly charming prince demands is impossible. Spinning straw into gold? He might as well ask her to fly. Her only hope is a family heirloom – a gold medallion rumored to be the magic prison of one of the fabled golden fae. Trapped inside the medallion for hundreds of years, Rue isn’t fool enough to trust Juliana, but he can’t help but be tempted by the feisty beauty. Even though she is the spitting image of the witch who betrayed and imprisoned him, Rue agrees to help her… for a price. 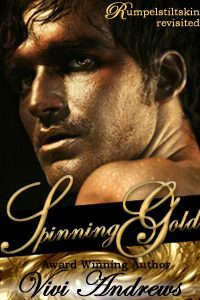 Entranced by the exotic, golden-skinned man, Juliana agrees to his terms, believing her worries are at an end. But when the tyrannical prince finds her surrounded by riches, he isn’t about to let her walk away – instead holding her prisoner within the corrupt court. Juliana’s only freedom is her nights with Rue, where their negotiations turn to seduction and together they construct a desperate plot to escape a life where they must keep spinning gold… or die.